Glass Onion Studio uses kiln fusing to create distinctive stained glass art that you can use to enrich your home or office. 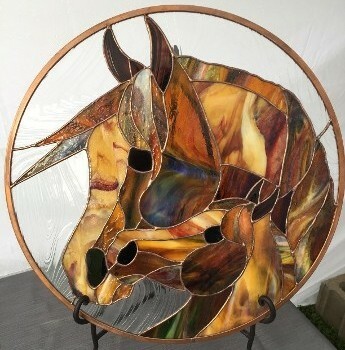 Our studio is unique because we can offer kiln fusing in our stained glass pieces. When creating a stained glass piece, we start with a pattern or photo. We then cut the glass into pieces to match the pattern. Copper foil is placed between the pieces of glass, and then we solder it all together and put a frame around it. Using this method, we create many things such as stained glass boxes and stained glass panels to hang in windows. All of our pieces have a quality that will brighten any room.